At Surgical Direct, we offer Mobile Cataract Services to Hospitals, ASCs, and Ophthalmologists all over the country. 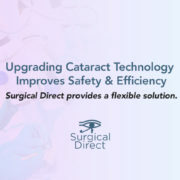 A Cataract Technician is provided on every surgery day with Surgical Direct. From experience, we know that eye surgery can often be viewed as “another world” to the surgical staff. Often times, the surgical staff at any particular OR may have 1 to 2 people who are familiar with Cataract Surgery. Some facilities that we step into have NO one experienced with eyes. Needless to say, this can cause the staff to be under stress on eye day. Cataract Surgery is a very repetitive procedure with high success rates, but this does not mean that it’s a simple procedure. It’s a highly-detailed, microsurgical procedure with numerous steps requiring precision and incredible detail. Each instrument is unique and has a specific purpose. One small circumstance can change the surgery dramatically, creating the need for backup instruments, a different lens implant, or specialty items that the surgeon hasn’t used in months. 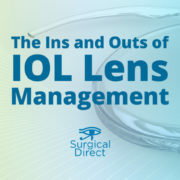 Unless your facility is an “Eye Center”, the likelihood of your staff being familiar with all the possible scenarios that could come about on surgery day is slim. The unknown or lack of knowledge can create a sense of anxiety on eye day, not only for the staff in the room but for the surgeon as well. A vital part of our Mobile Cataract Service model is our Technician. It might seem silly to take a cherished past-time (golf) and a surgical procedure and try to cross-reference similarities. One is a sport, a past-time, a way to relax and get your mind off of life on a beautiful par 5. The other is a surgical procedure that can greatly determine the future eyesight of a human being…not to be taken lightly in the slightest. However, when discussing what it is we actually do as a company, the picture of our Surgical Technicians being like a caddie in your OR on eye day is a simple and accurate way to paint the picture. In fact, one of our very own technicians (Dustin Anthony – Regional Operations & Phaco Technician), of his own inspiration, wrote about his position at Surgical Direct Inc and references the “caddie” concept and his pride in his role. Read his post on LinkedIn, we think you’ll enjoy it. The SDI technician brings the equipment needed for the surgeon to “play his best”. He brings the latest technology to the OR on surgery day. And just as a caddie cares for the clubs, making sure that they are clean, and ready when needed, a tech ensures all the equipment is ready to go for each surgery. In order to become an SDI technician, you must go through an initial 90-day intensive training, complete with a final exam. Each technician is trained thoroughly in Phacodynamics, OR protocols, Aseptic training, principals of light, anatomy of the eye, and our intensive equipment training program. And that’s just the first 90 days! An average SDI technician provides support for roughly 80-100 cases per month. And the majority of our technicians have held their positions for years. Each cataract technician has the technical know-how to provide insight to the staff and surgeon on the equipment, supplies, instruments, and lenses. But just because we may know a lot of about the surgery, doesn’t mean that we are above taking the trash out, running to the clean core to help find an instrument the surgeon is asking for, or helping turnover the room in between cases. Support is our service. 3) We are aware of the challenges and obstacles of the course. The in-depth training and sheer volume of surgeries our technicians have been through creates an awareness of surgical steps and the possible outcomes should an issue arise. The majority of the time, our technicians are prepared and ready for possible issues. A seasoned technician can be alerted to issues simply by hearing a change in the machine’s pressure reading tone, or knowing when a surgeon is performing a certain step slower than expected. If the surgeon expects that a case might be complicated, he alerts the tech of possible items that he might need during that case. Our techs take it a step further, and know that “if he opens this, then he might need that….and I’ll want backups in the room just in case so I don’t have to run out of the room to get them”. Preparedness and awareness of the “obstacles” help the surgery day run as smooth as possible. Happier staff. Comfortable surgeon. Better outcomes! Better day! “Behind every successful golfer is a caddie with a steady presence”. Read this fascinating article The 36 Greatest Caddies of All Time, and I think you’ll agree that relationship plays a vital part in trust and success of a golfer and his caddie. We believe this to be true with our cataract technicians as well. That’s why we do our best to schedule our technicians strategically every month so that our accounts are seeing familiar faces. Our technicians become part of your surgical staff on eye day. Over the years, many have become “work family” in our accounts. It’s our goal to provide that “steady presence” so that every surgeon and staff we work with can achieve success. There are several mobile cataract services out there. But we firmly believe that our cataract technicians at Surgical Direct are what makes our service stand out. Could your OR use a Cataract Caddie? Want to know more about Surgical Direct and what our services can bring to your OR? Check out our recent post about 5 Headaches Eliminated with Mobile Cataract Services to see how Surgical Direct can help alleviate your cataract surgery stress.